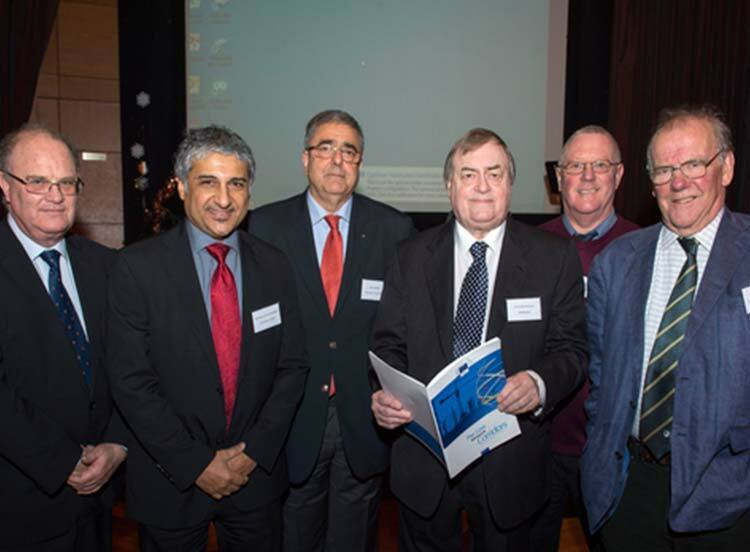 Opportunities for Humber businesses from the European Union’s Motorways of the Sea initiative came under the spotlight at a high profile event organised by the University of Hull today, (December 15). It brought together business leaders, academics and senior EU officials on board the Hull-Rotterdam ferry at King George Dock a lunchtime briefing, which included the influence of the Northern Powerhouse on the project. Professor Amar Ramudhin, director of the Logistics Institute at Hull University Business School, said that the initiative had great commercial potential for the region and stressed that the Humber must achieve ‘high visibility’. Other speakers at the briefing, chaired by Lord Prescott, were: Brian Simpson, EU coordinator for the Motorways of the Sea programme; Captain José Anselmo, the programme’s senior administrator, and Lord Haskins, chairman of Humber Local Enterprise Partnership. The briefing attracted guests from large companies in the maritime, offshore, ports, logistics, manufacturing and energy sectors in the Humber, Yorkshire and Merseyside. The objective of Motorways of the Sea, first conceptualised in 2001, is for shipping to play a much greater part in the movement of goods across Europe. The European Commission believes these maritime routes, allied to other forms of transport, mainly rail, will bring relief to the over-stretched European road system as well as environmental benefits. It is supporting the programme with more than one billion euros. “The University is leading the effort to get all partners together so that they can gain commercial benefits from the Motorways of the Sea programme,” said Professor Ramudhin. “The idea is to ship more freight by sea in a more environmentally way. “We are looking at the real potential of creating new services or improving existing ones between the Humber and Northern Europe that could eventually be set up with our partners and key stakeholders. “It is important that the Humber has visibility with the EU and establishes itself as the European Gateway. The onus is on us to prove that we can facilitate the management of goods and sort out the kinks in the system for a truly integrated service by providing good physical and digital connectivity.” One possible benefit would be better short-sea crossings with the Baltic states, he said. The Motorways of the Sea programme is part of the Trans-European Network after being proposed as a ‘real competitive alternative to land transport’. Several have been set up, including the Motorway of the Sea of western Europe and Motorway of the Baltic Sea, which both include the North Sea and the Irish Sea and linked through the Hull-Liverpool corridor. Lord Prescott said that his vision of ‘enhanced multi-modal connectivity’ along the Hull-Liverpool corridor was critical to bringing economic benefits.